This 1996 rendition of the Shakespeare classic is a frantic, beautiful, modern-dress masterpiece. 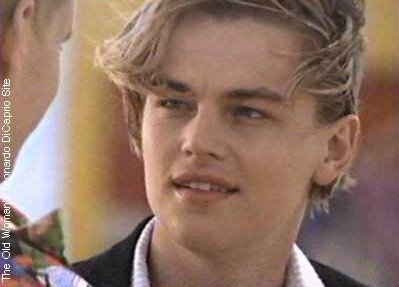 Leonardo DiCaprio is Romeo, a Montague, and Claire Daines is Juliet, a Capulet, "star-crossed lovers" whose families hate one another, and who strive for joy in the face of tragedy and violence. Romeo is just getting over the fact that the woman who's affections he's been courting -- Rosaline -- has rebuffedhim and decided to "live chaste". Against his better judgement, he is dragged off to a costume party by his friends. The party is being held at the mansion of the Capulets, the family against whom Romeo's own family (the Montagues) has a long-lived bitter rivalry. Nevertheless, while he's there, Romeo meets and falls instantly in love with Juliet Capulet, the daughter of his own father's hated enemy. Their families' discord, however, cannot keep the young lovers from quickly courting and secretly marrying one another. But the couple's bliss is short-lived. Juliet's cousin, Tibalt (played effectively by John Leguizamo) challenges Romeo and his friends to a fight in a public place. Without telling Tibalt that he's married Juliet, Romeo attempts to dissuade Tibalt from attacking, but Tibalt hates all Montagues, and will not listen. He beats Romeo into the ground and tries to kill him. Coming to Romeo's aid, Romeo's best friend, Mercutio steps in and is mortally wounded. 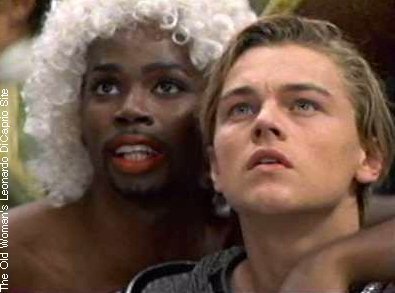 When Mercutio dies, cursing both the houses of Montague and Capulet for the fued that has made "worm's meat" of him, Romeo goes mad with grief and rage, and hunts Tibalt down through the city. The two clash in front of a church, and after warning Tibalt that one or both of them is going to die that night, Romeo shoots Tibalt to death. 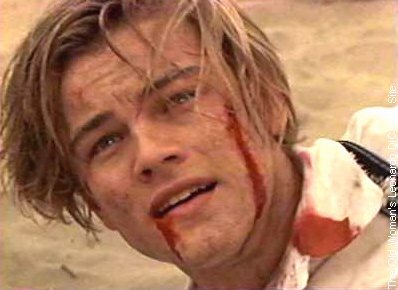 As punishment for the murder, Romeo is banished from Verona Beach. Before sequestering himself away in Manchua, a desolate trailer park outside Verona Beach's city limits, Romeo seeks out Juliet and the two of them spend one night of joy together as husband and wife. In the morning, Romeo flees... and Juliet learns that her father has promised her in marriage to a young prince named Paris. Without revealing her secret marriage to Romeo, Juliet rushes to the church where her friend and mentor, Friar Lawrence, lives. Grieving for her lost Romeo, and refusing to be married to Paris, she threatens to kill herself. Friar Lawrence, however, has a different plan in mind. He will give Juliet a potion that will make her appear dead, and he will send a note to Romeo telling him about the counterfeit. When Juliet's family gives her up, believing she is dead, she and Romeo can meet and run away together. Juliet agrees to the plan, and drinks the potion. On the morning she is to be married to Paris, she is found "dead" in her bed. Her family transports her to the church, where they grieve over her in an elaborately decorated funeral. Romeo's friend, Balthazar, unaware that Juliet's death is a fake, sees her in her coffin and, believing that she's dead, rushes to inform Romeo. In Manchua, Romeo has not received the note from Friar Lawrence, so when Balthazar arrives and tells him that he's seen Juliet dead, Romeo races back to Verona Beach to see it for himself. Because he has been banished, when he's spotted in Verona Beach, the police chase him and try to capture him. He runs to the church where Juliet still lies, and bolts the doors so no one can enter. When he sees her in her coffin, he is overcome with emotion. Speaking over her softly, and kissing her, Romeo produces a vial of poison from his pocket. Romeo drinks the poison... just as Juliet revives from her drug-induced sleep. He is startled to see her alive, and tries to speak to her, but the poison he's drunk is too powerful, and he dies in her arms. Overwrought, Juliet finds Romeo's gun and shoots herself in the head. She collapses next to him, dead. When their families find them, they join in sadness over the young lovers' gross misfortune. OUR REVIEW: This rendition is nothing short of amazing. The modern-day situations, clothing, sets, and camera work lend themselves perfectly to Shakespeare's play. And although Shakespeare's classic language is used throughout, it enhances, rather than distracts from the film. The little touches -- of making the Capulets and Montagues "gang" members, of replacing guns for swords and daggers, and of modernizing some of the inuendoes hidden under Shakespeare's words (*) -- combine with superb acting from everyone involved to make this movie a "classic" in its own right. 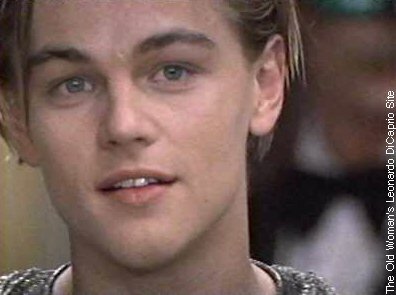 DiCaprio and Danes are perfection in the lead roles of Romeo and Juliet. Youthful in appearance, but well-seasoned in their acting ability, both carry off their performances with astute aplomb. Romeo's rage over the death of Mercutio, especially, is well played and thoroughly believable... as is Romeo's astonishment and despair when he realizes that he's killed his new wife's favorite cousin, Tibalt. Had these extreme emotions been "under played" or portrayed by a lesser performer, the downward spiral of the rest of the story would not have been believable. DiCaprio performance is enhanced by a supporting cast that are also wonderful in their respective roles. If you buy no other video this year, buy this one. It's a splendorous visual and emotional marvel. (*) When Tibalt accuses Mercutio of "consorting" with Romeo, it comes off sounding more like he's accusing them of being homosexual lovers. And when Mercutio talks about their fight coming to "blows", he says the word as though he's telling the other's "blow me". From Mr.Showbiz on the web: "...The place is a mythic, turn-of-the-millennium nowhere called Verona Beach. Two corporate skyscrapers--one labeled "Montague," the other "Capulet"--rival one another for predominance over the smoggy big-city horizon. Street gangs fight, riot, and spout poetry in the name of the two warring families. 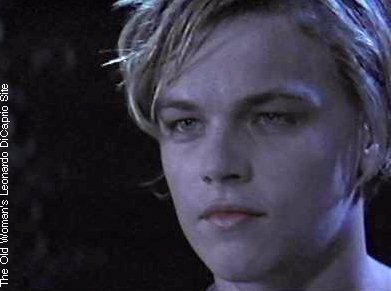 At a glitzy masquerade ball presided over by drag queens, Romeo (Leonardo DiCaprio)--young heir to the Montague fortune--sets his eyes on the Capulet heiress, Juliet (Claire Danes). For both, it's love at first sight, and their passion spins the bloodthirsty world of corporate loyalties off its orbit. Director Baz Luhrmann (Strictly Ballroom) brings such a radical, brilliant, hands-off-the-handlebars bravado to this adaptation of Shakespeare's most romantic masterpiece that one could be dazzled and delighted from end to end by its wit... DiCaprio and Danes each have tremendous magnetism in their respective spheres, but they never connect with one another. Luhrmann's hyperkinetic visual imagination hides this well. When we first meet Juliet, she is submerged in her morning bath, smiling out at us through the bottom of the tub as if it were the wall of an aquarium, her red hair coiling about her face like the watersnakes of a mermaid Medusa. The famous balcony scene is lit from below by the blue rectangle of an immense swimming pool, and eventually the lovers fall in. 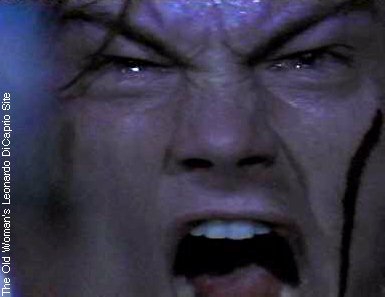 Whatever spark they lack on dry land, DiCaprio and Danes are transfigured underwater, and Luhrmann dunks them at every opportunity. DISCLAIMER: All of the written text and animated GIFs associated with this site are the sole property of TheOldWoman, unless noted otherwise, and may not be reproduced in whole or in part without Mare's permission. All of the images associated with this site are the sole property of the original filmmakers and/or photographers, unless noted otherwise, and are reproduced here under the auspices of "fair use" of copyrighted materials to accent reviews, promote the projects of Leonardo DiCaprio, and entertain his fans. No, I cannot reproduce hard copies of the images for you, so please do not ask. FYI: For those of you who have asked, most of the images created for this site were done so with the help of the SNAPPY Video Snapshot program and the GIF Construction Set program available on the net. 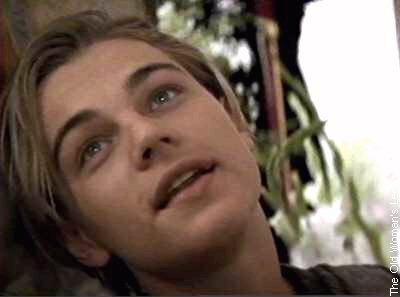 MORE IMAGES FROM "ROMEO + JULIET"
TO GET A COPY OF THIS VIDEO, try your local video outlets, or Blockbuster Video, Columbia House Video, or Reel Video on the web.